Have you completed your 2009 taxes yet? 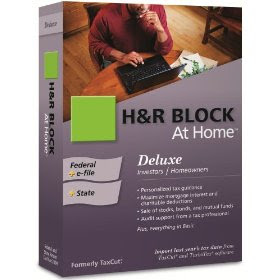 If not, you can get H&R Block At Home 2009 Deluxe Federal + State + eFile for only $19.99 today – that is a savings of over 56%!! This item qualifies for free super saver shipping when you spend $25.00 on qualifying products. Or, if you have Amazon Prime (trial or paid version), you can get it shipped for free without any other purchase! Don’t have prime yet? Just click the “Add to Cart with Free Two Day Shipping” button and you’ll be able to sign up today!